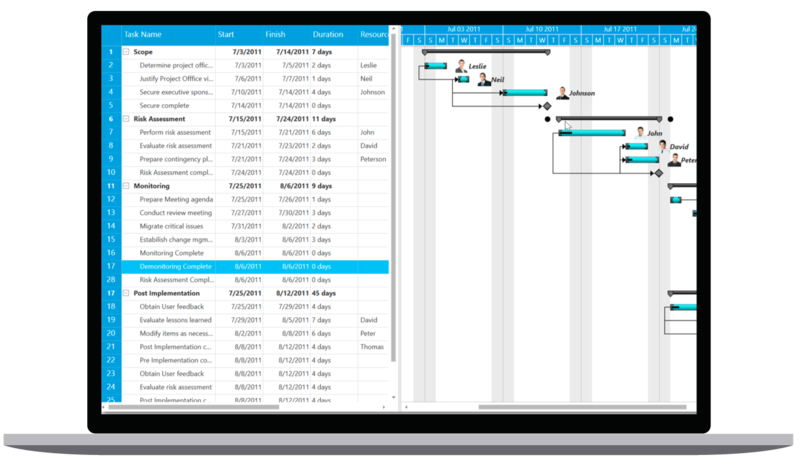 The WPF Gantt control provides a Microsoft Project-like interface for scheduling and managing projects. Its intuitive user interface lets you visually manage tasks, task relationships, and resources. You can specify relations between different tasks to determine the order in which the tasks need to perform. The relationship links can be finish-to-start, start-to-finish, start-to-start, and finish-to-finish types. Columns can be sorted either based on a single field or column, or on multiple columns or fields. A task’s fields, such as duration, start date, end date, and predecessors can be edited directly in their respective cells. Highlights the chain of linked tasks that affect the project finish date. The WPF Gantt provides support for zooming the time period of the task. Important days or events in a project can be highlighted using strip lines. Dynamically add baseline columns to help better analyze the current progress made against the baseline estimations. It is also possible to display baseline statistics with custom visual elements like charts. Tasks are grouped based on resource in a single row to create the resource view. There is built-in support for exporting the visible region or the entire Gantt chart as a JPEG, PNG, or BMP. Easily import and export between the WPF Gantt control and Microsoft Project.